How do we interpolate between two quaternions representing rotations? For instance we may want to fill in some gaps between calculated rotations to make an animation less jerky. (It is interesting that this looks like a vector dot product). So what is the equation that allows us to calculate the interpolated quaternion? There seems to be a paper about this which everyone quotes: [Ken Shoemake, Animating rotation with quaternion curves in SIGGraph '85 proceedings]. However this seems to require membership so I have not read this. Let us take the 90 degree rotation in example 1 on transforms page and calculate two interpolated points. Try spherical interpolating between the rotated value (0.7071 + k 0.7071) and the non-rotated, identity, value (1). The following code generates a quaternion between two given quaternions in proportion to the variable t, if t=0 then qm=qa, if t=1 then qm=qb, if t is between them then qm will interpolate between them. This is based on code sent to me by Anthony(Prospero). Also thanks to Josh for sending a number of improvements. // Calculate angle between them. When theta is 180 degrees the result is undefined because there is no shortest direction to rotate, I don't think this situation is handled correctly yet, it would be better if we choose some arbitrary axis that is normal to qa or qb, I would appreciate any ideas for the best way to do this. 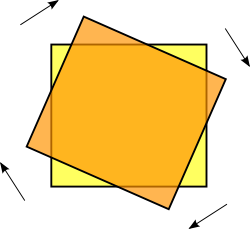 There is an easy way to interpolate a rotation into 2 equal halves, as explained here. Thank you to Martin aus Chemnitz for letting me know about this. You may need to add the following code after cosHalfTheta is calculated. inverting either of the quaternions (qa or qb) will invert cosHalfTheta, but then we call acos, according to this page. acos always returns a value between 0 and 90 degrees (0 and Pi/2) for positive inputs and 90 to 180 degrees (Pi/2 to Pi) for negative inputs. But sinHalfTheta will be the same if it is inverted or not. We want to return the shortest angle, i.e. therefore we need cosHalfTheta to be positive. but should we invert qa or qb? Since they represent the same rotation, I guess it doesn't matter which we invert. I think there is another way of looking at this. If qa is our starting orientation (say along the x axis) and we start to rotate qb away from it, cosHalfTheta will start at 1.0 and when we get to 180 degrees then cosHalfTheta will be zero, if we rotate beyond 180 degrees then cosHalfTheta will become negative and when we have rotated by 360 degrees then cosHalfTheta will be -1.0. cosHalfTheta wont be back to its original value until qb has rotated through 720 degrees. So we may want this to operate either way, if qb has rotated 360 degrees we may want to interpolate through a complete rotation or we may want to treat it as 0 degrees and so all the interpolated rotations will be zero. It might be best if this modification is optional? There is a very good article on this web site. (thanks very much to ovillellas for letting me know about this). A transform maps every point in a vector space to a possibly different point. When transforming a computer model we transform all the vertices. To model this using mathematics we can use matrices, quaternions or other algebras which can represent multidimensional linear equations. A spinor represents a transform where a rotation of 360° inverts the object. To restore the object to its original orientation we need to rotate by 720°. Noel Hughes has kindly sent me some papers with quaternion training and how this can be applied to spacecraft based on his work in that area. He enjoys challenges, mathematical, operational, developmental or whatever. He is also available for consulting.